Andrew Reviews, "So You Want To Move To Costa Rica?" Just about everyone I know who lives in a temperate climate dreams - for at least a month or two during the height of the cold season - of moving somewhere where winter's bitter chill never arrives. Raw foodists and health enthusiasts seem even more of this persuasion, dreaming of sun exposure and tropical fruit. It's probably not too much of a surprise, then, that a prominent Canadian fruit lover has written a book covering his attempts to move to the tropical paradise of Costa Rica, and his advice for those who want to do the same. 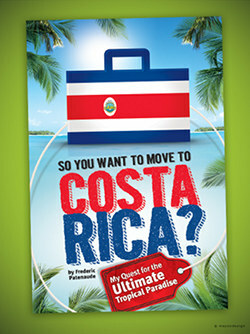 Although there are dozens of similar books, I decided to give Frederick Patenaude's, "So You Want To Move To Costa Rica?" a read. If you’re an ardent pursuer of health like I am, you know that there are certain questions you want the answers to that most travel writers just don’t cover because they don’t think the same way you do. I was hoping Fred would break the mold. You can find my review of, "So You Want To Move To Costa Rica?" here. 1) Ryan wants to know how to save money shopping for a raw food diet. I tell him here.